Welcome to The Abso!ute Sound online! We explore music and the reproduction of music in the home. We believe that the sound of music, unamplified, occurring in a real space is a philosophic absolute against which we may judge the performance of devices designed to reproduce music. Our goal is to provide the resources consumers need to judge how a component's sound either honors or departs from the music's truth, and to make sound purchasing decisions that maximize their experience of reproduced sound. Below is our Issue 139, December 2002 / January 2003 table of contents and editorial. J. Gordon Holt explains the ins and outs of bass management, and reports on a trio of multichannel SACDs from Telarc. Veteran LP spinner Jonathan Valin looks at the Walker Proscenium Gold Signature, a tweaky masterpiece of a record player, says he. Hmm…wondering what to get your audiophile pal for Christmas? Take a peak inside TAS' holiday stocking. Jason Serinus talks with the San Francisco Symphony's popular and innovative conductor about Leonard Bernstein, recording in multichannel SACD, and his ongoing Mahler cycle, while Paul Seydor listens to the latest in that series, the Mahler First. TAS recommends a wide range of full-function preamps, linestages, phono stages, and even a few passive volume controls. Our annual picks for the very best components. A receiver in TAS? Shock, horror! Chris Martens reports on this affordable and musically satisfying effort from Rotel. Neil Gader and Paul Seydor audition and evaluate 13 interconnects priced between $129 and $250. Dan Davis explores Cary's CAD 808-affectionately known as the "Rocket 88"-a not-so-conventional tubed amplifier. Peter Braverman likes what he hears from this Canadian company's latest design, and it's modestly priced, too. Though not "perfect," Bob Carver's newest Sunfire amp is a state-of-the-art contender, according to Paul Seydor. Yes, it's single-ended, and yes it's triode. But unlike so many of its exotic brothers, Ayon's (formerly Vaic) 300B doesn't cost a fortune. Stephan Harrell reports. 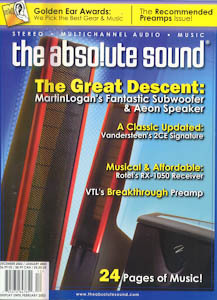 Wayne Garcia listens to the latest 'Logan hybrid, and the company's first-ever subwoofer. Robert Harley checks out a pair of separates from one of England's most respected brands. Senior reviewer Art Pfeffer on VTL's first flagship linestage in over a decade-a two-chassis beauty that refashions the role of the audio preamp. While equipment may be more fun, room acoustics are just as important to the sound of our systems. Editor-in-Chief Robert Harley's room gets a full makeover from a brand new company. 133 - 2002 Music Golden Ear Awards For 2002's Golden Ear Music Awards, each music writer, giving equal consideration to musical and sonic merits, chose three of his favorite records released between October 2001 and 2002. We invite you to use these as a guide to some of the year's finest.